Finally it happened, we got a booking for the elusive destination wedding film with all the trimmings, the holy grail of wedding bookings to most wedding videographers. Super cool, good looking and down to earth couple. Check. Stylish friends and family all a laugh to get on with. Check. An old Italian town outside Tuscany where the ceremony was conducted by the Mayor of the town. Check. Secluded Italian villa in the middle of nowhere atop a hill with views as far as the eye can see. Check. 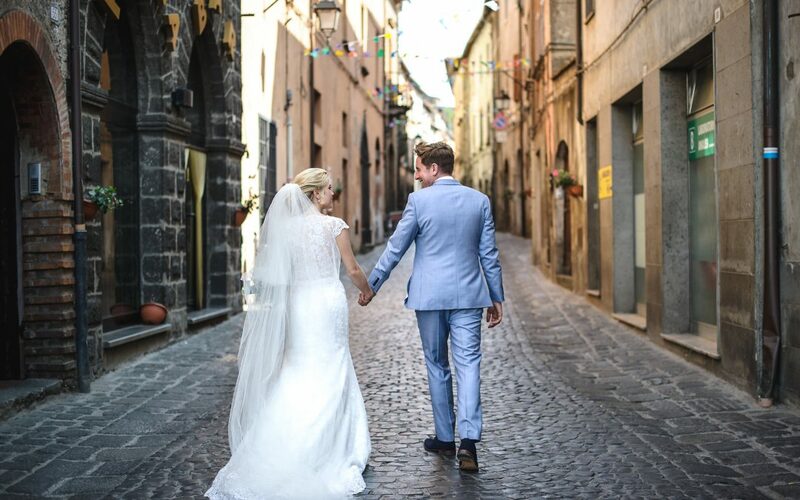 We were booked alongside Matt Baxter from Matt Baxter photography, a relative newcomer to the wedding industry but with almost a decade worth of music photography behind him he was great to hang out with during our time in Italy and we’ve become friends since. You can check out his wedding photography here. As with any destination wedding film we had to head over a couple days before the wedding. This takes away the added stress that can sometimes occur when travelling with camera gear and having to get to basically the middle of nowhere the other end when we landed. By the time the wedding day rolled round we really did feel like one of the guests, on a regular wedding we fit in well with everyone but here, with the extra time we shared, it really was like filming a friends wedding. Megan and her bridesmaids, and the best grandmother we’ve met, got ready in a hilltop villa with unbelievable views. The makeup artist set Megan up in the perfect position allowing us the great shots you see below. We had a lot of time with Megan in the morning as Paul was having some time to himself rather than have us film him. Fortunately we did manage to grab just enough clips of him before the ceremony to give a nod to his late father with his very personal dragonfly broach he wore on his suit. The ceremony itself was conducted in Italian by the local mayor and translated by a local lady. Held outdoors in bright sunshine it was a great setting. The personal touch happened via Paul’s idea to have the congregation sing ‘All you need is love’ by the Beatles, just before they walked back down the aisle as man and wife. A special unique moment. A quick trip along some cobbled then non existant dirt roads and it was back to the villa for things to start to wind into the food and party times that lay ahead. Aperol Spritz and Peroni were the drinks of choice, enhancing that Italian feel alongside the canape’s of ham carved off the bone infront of you and mozzarella troughs alongside a whole range of other cheeses. Around this time the light in Tuscany peaks, it’s difficult to describe unless you’ve been there but it is simply stunning to see in real life and to capture on film, one of the most visually pleasing aspects of a destination wedding film. Again we grabbed a few more couple shots as well as more relaxed shots of the rest of the guests and Megan and Paul with their respective parents. Dinner was then served followed by speeches, unfortunately these ran on a tad too long at 2.5hrs! Fortunately we had brought our video lights which saved the speakers from standing in complete darkness without any of the guests being able to see them! With a number of successfull Ibiza DJs among the guests the party got in full swing pretty quickly, gran was still going strong at this point, Paul not so much, feeling the relief of getting his speech over successfully. The night ended late and then it was off back to our own villa to sleep for what felt like half an hour before driving back to the airport for our flight out. Destination wedding filming presents a lot of challenges, we believed we were prepared and nothing went wrong, however, we did without doubt learn a lot about the logistics of them and how this can impact a film: only possible to know having gone through the process. Having achieved the goal of filming a destination wedding before the end of 2017 we’re hoping for a lot more of them in the coming years. If you’d like to discuss your destination wedding film please do reach out and get in contact with us.